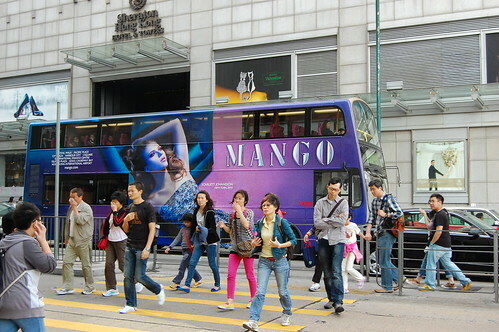 When you arrive in Hong Kong, the first impression you get is that of a developed city, but still with many characteristics typical of China. 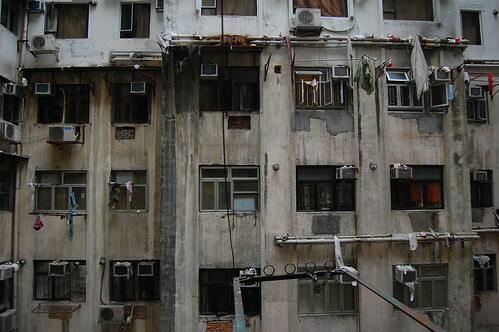 I thought Seoul was a city of contrasts, but in Hong Kong contrasts are much, much more exaggerated. 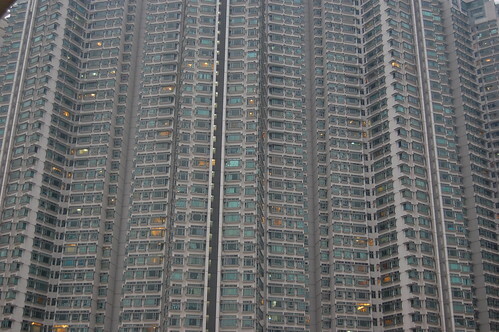 Hong Kong is one of the most densely populated cities in the world, and you can feel that just seeing some of its apartment complexes, true swarms of people. The sea is one of the things I miss the most in Seoul. It definitely gives any city lots of life, and mixed with a great skyline… it’s just a perfect place to stay. 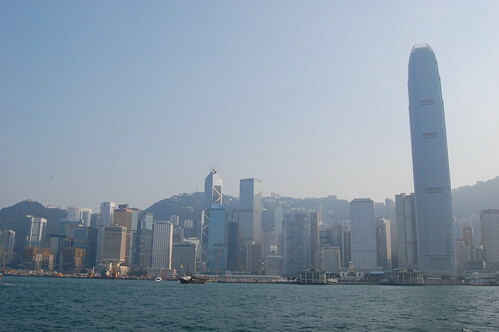 Hong Kong is also popular for its martial-arts movie stars like Bruce Lee or Jackie Chan. 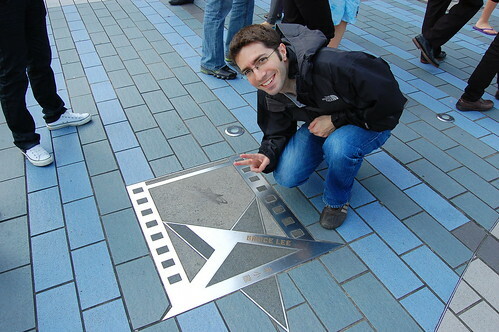 Here is Bruce Lee star. The view from our hostal was probably the worst I have had to deal with, but it was cheap, the room was clean and there was hot water, so we decided to just keep the window shut. During my trip to Hong Kong, I could meet my friend and former internship colleague Javier, also known as Chicharrero por Hong Kong. 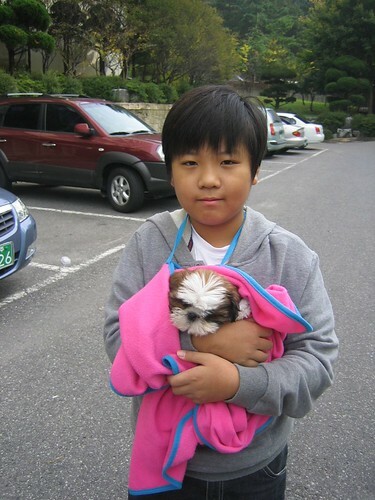 He also visited Seoul not long ago. 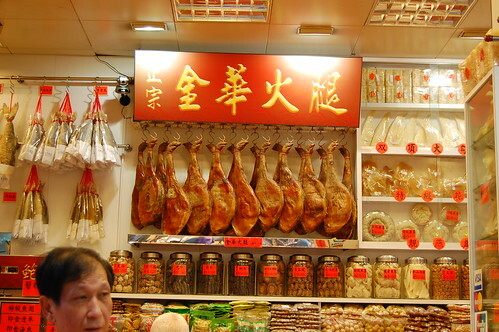 It seems that they also eat Jamón in Hong Kong. Filipino women gathering on their day off. 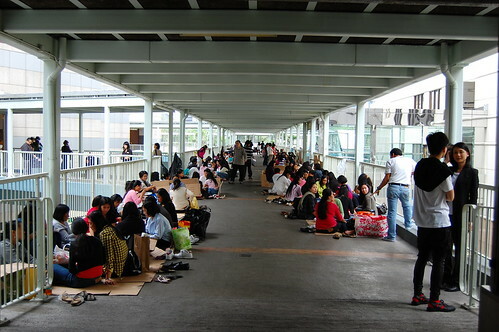 There are around 140,000 Filipinos in Hong Kong. Most of them are women who came to work as maids or nannies. 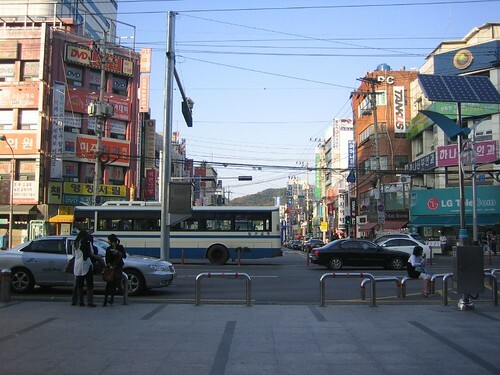 On sundays, they gather together near Statue Square to socialize. We could see groups of Filipino women doing all kinds of cultural activities, traditional dancing, praying, playing cards… not a bad way to spend your day off. 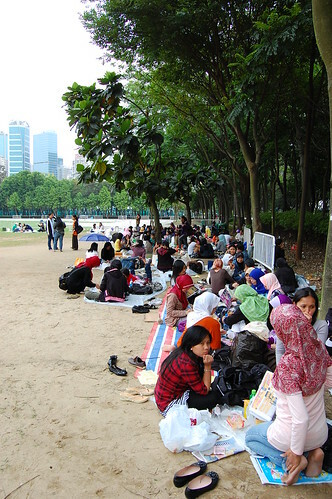 Indonesians in Victoria Park. 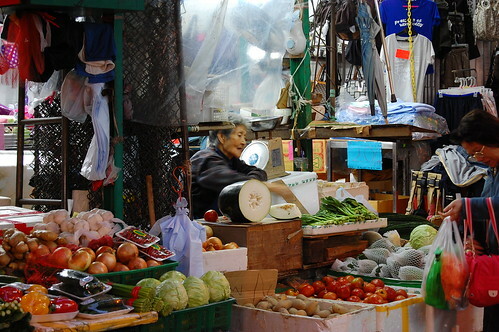 In a similar way to Filipino servants, there are also many Indonesians in Hong Kong. We could also see their gathering place, and I can assure that there were many, many of them. 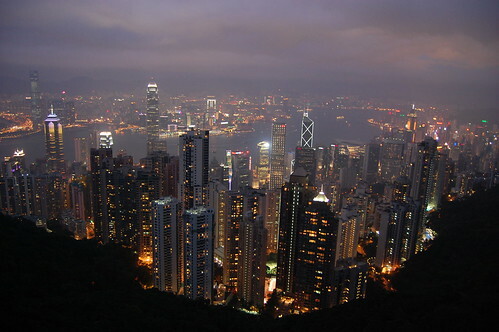 But probably to see the most impressive Hong Kong, you have to see it during the night. The skyline, the lights, the life of this city made us forget how tired we were after walking around all day long. 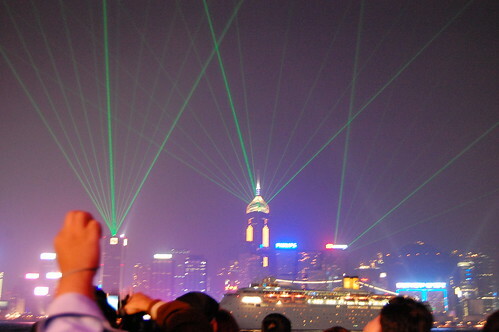 The skyline light show takes place every night from 8 to 8:15 PM. 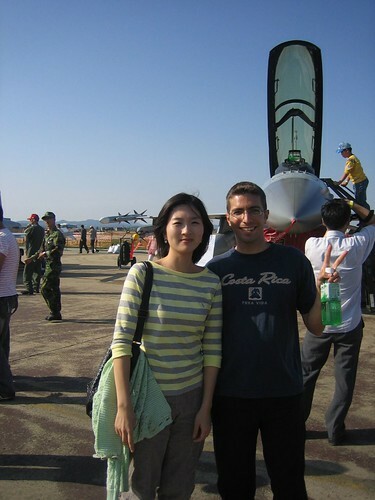 It is recommended to get there in advance, as there are a lot of people and it is not easy to get a good place to see the show. 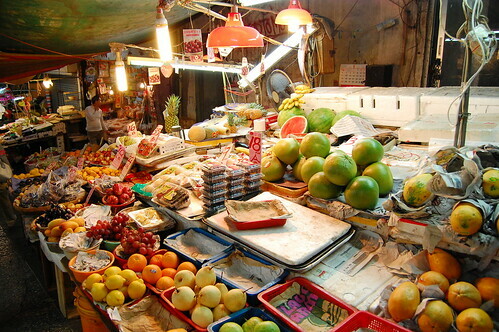 Street markets in Hong Kong are quite similar to those you can find in Seoul, selling all kinds of fruits, some of which I had never seen before. 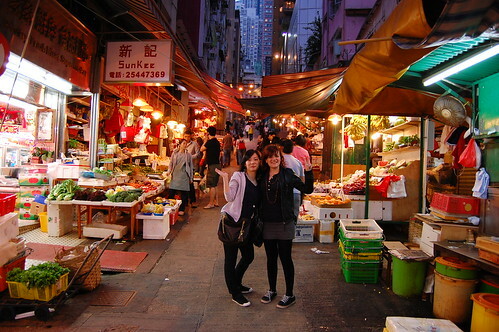 Jiwon and Nuria at a street market near Central. Awesome view of Hong Kong from the Victoria Peak. 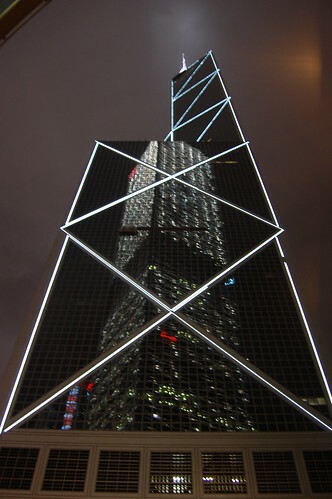 View of the Bank of China Tower at night, undoubtedly one of the most representative skyscrapers of Hong Kong. 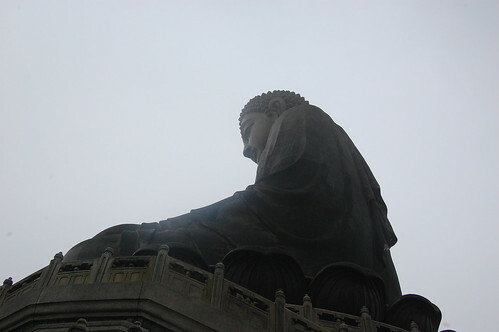 During our last day in Hong Kong we decided to visit another attraction of Hong Kong, the Big Buddha, or Tian Tan Buddha, located in Lantau Island. Nuria and Jiwon in the cable car that goes to the Big Buddha. We were not very lucky, and happened to go on a very cloudy and foggy day, so we couldn’t see the Buddha from very far away, which is one of the best sceneries. 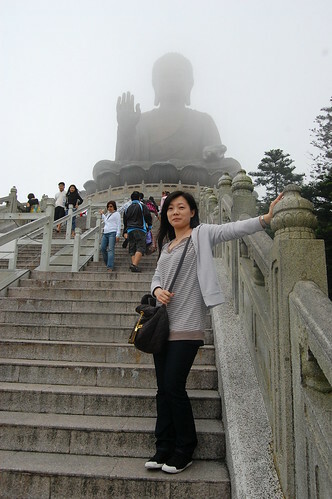 Jiwon with the Big Buddha. 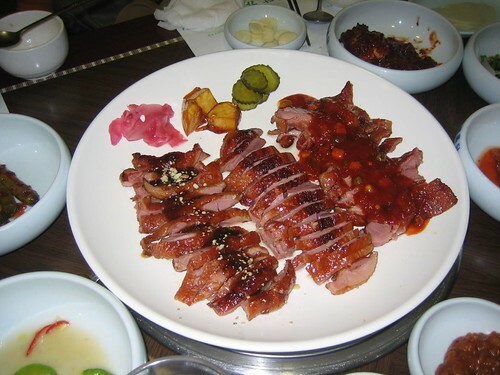 Gumi is known for being the birthplace of Park Chung-Hee, former president of South Korea (from 1961 to 1979), as well as for hosting some factories where Samsung cellphones are made by its subcontractors. 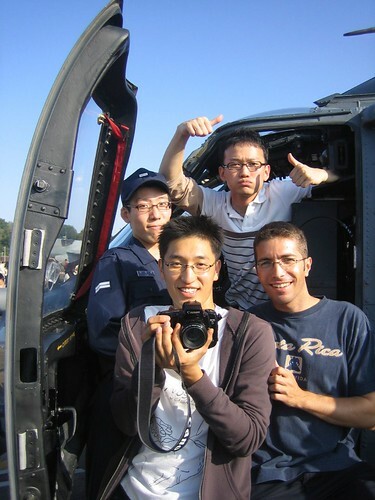 On Saturday they took me to the top of the Geumo (“Golden Crow”) mountain, where you have a very nice view of Gumi. 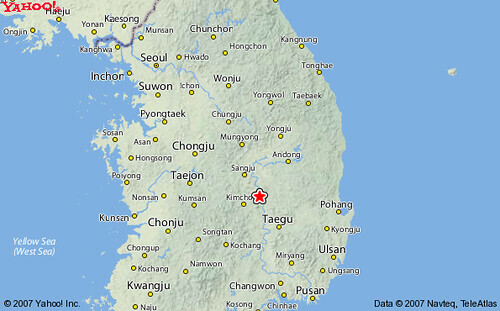 On Sunday, we went to a Buddhist temple in Kim-Chon (see the map), a city near Gumi. Because fall is coming and the trees were turning red, and also because it was Sunday, it was pretty crowded, but we had a nice time and I could see real monks praying for the first time in my life. On the way back to Seoul, we took a faster train, the KTX (Korean Train eXpress), based on the French TGV (runs at around 300 km/h). 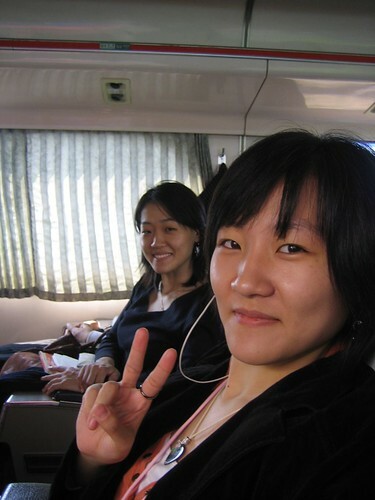 Ga-Young and Eun-Hye on the train. 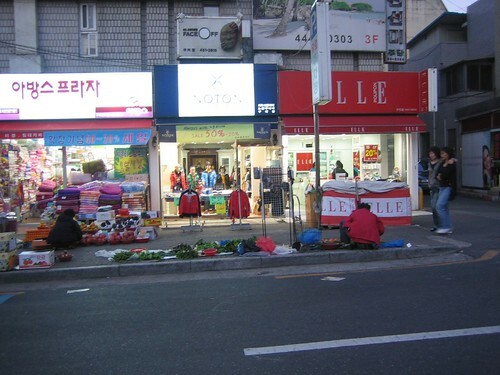 Selling vegetables on the street. 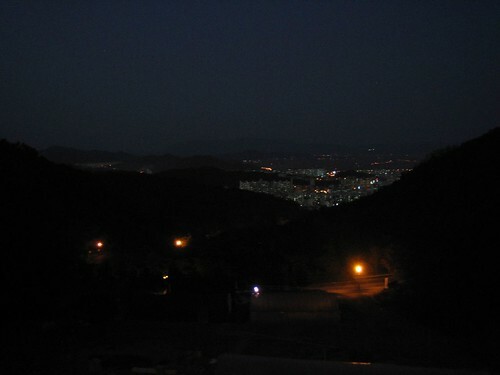 Gumi from the Geumo mountain. 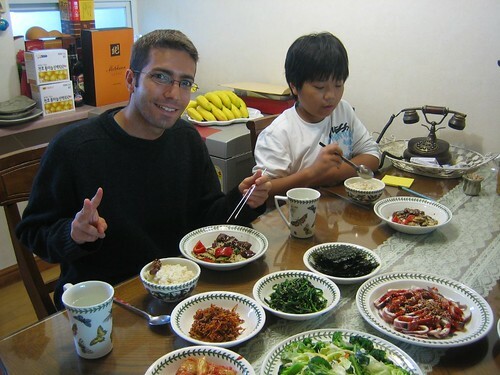 Having a typical Korean breakfast. 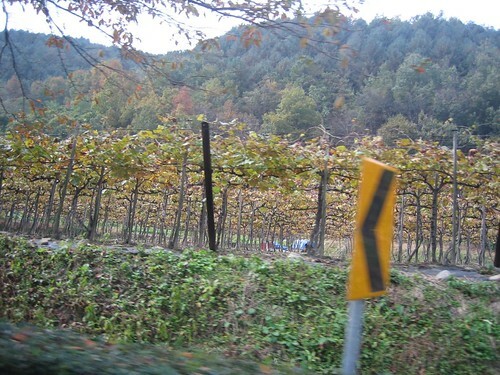 These are vines. They put sticks so that the grapes grow above the floor. 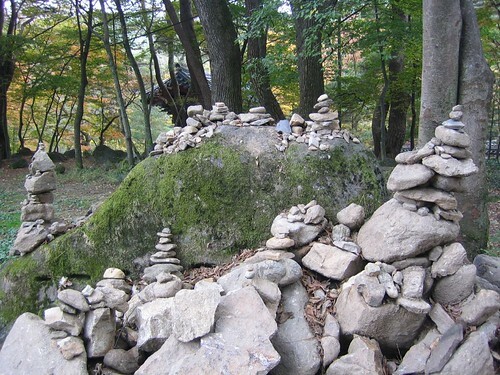 When people come to pray, they put a stone making these piles. 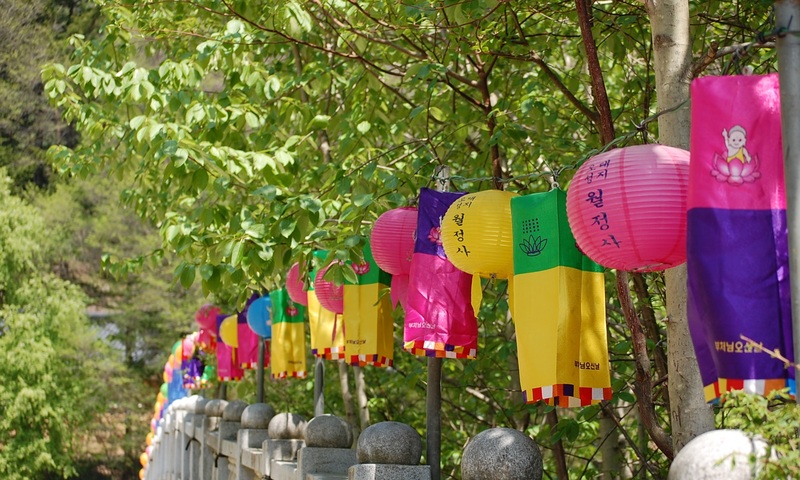 You have to be careful, because if the stones fall, it will bring bad luck. 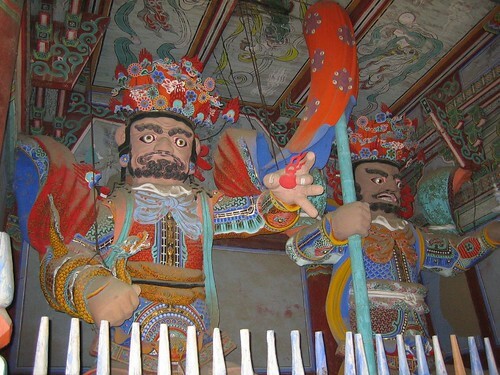 These are the temple’s guards… scary, huh? 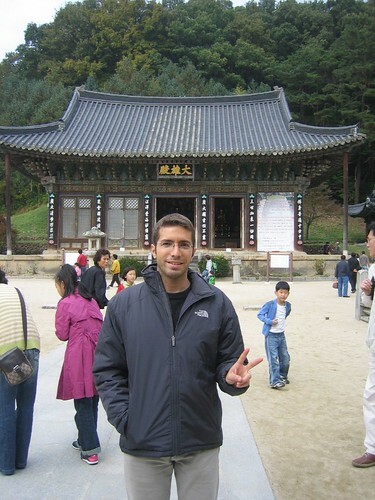 Standing in front of one of the many temples. 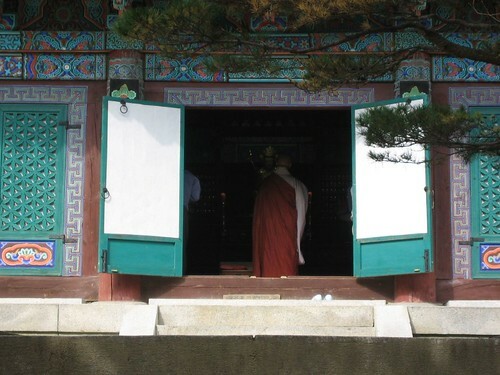 There were some real monks praying to Buddha. 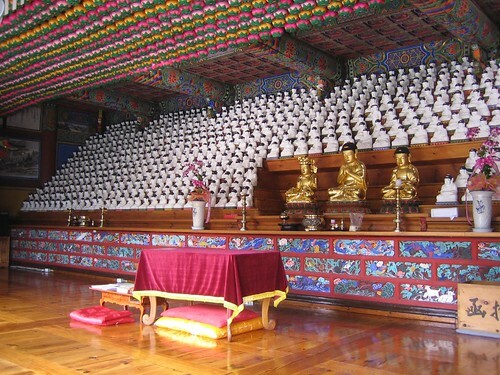 There are 1000 buddhas in this room. Can you find the only one standing? 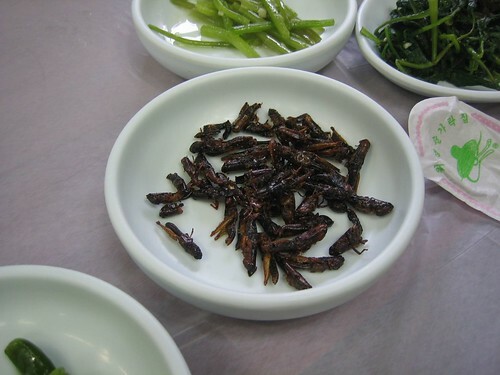 Yes, these are grasshoppers, and I tried one! 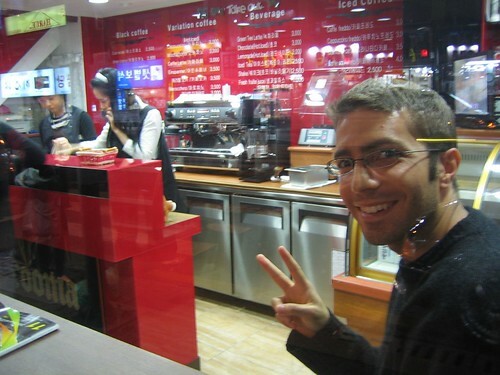 At Ga-Young and Eun-Hye’s family coffee place.